The 5th Regiment Cavalry, or First Ira Harris Guard, mustered into service for three years during the late summer and fall of 1861. 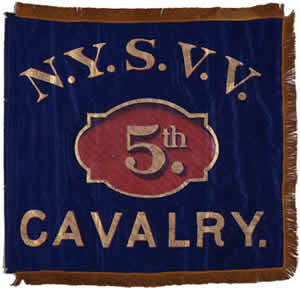 When the term expired, those entitled were discharged and the regiment continued in service as “Veteran Volunteers,” as indicated by the “N.Y.S.V.V.” on these blue silk flank markers. Both flags feature painted inscriptions and a semi-elliptical red shield in the center on both sides. “N.Y.S.V.V.” and “CAVALRY.” are in mirror image on the reverse for both. 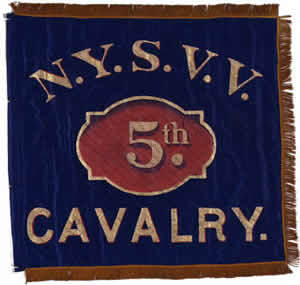 See 5th Cavalry Regiment History Pagefor more information about the unit.